Snub Nose Snap-Fit Syringe | Centrix, Inc. The Snub Nose Snap-Fit Syringe delivers convenient, time-saving features in a small package. Centrix recently introduced its new Snub Nose Snap-Fit Syringe, expanding its patented C-R Syringe product line. The Snub Nose has all of the same time-saving, convenient features of the Snap-Fit Syringe, but with a shorter barrel. 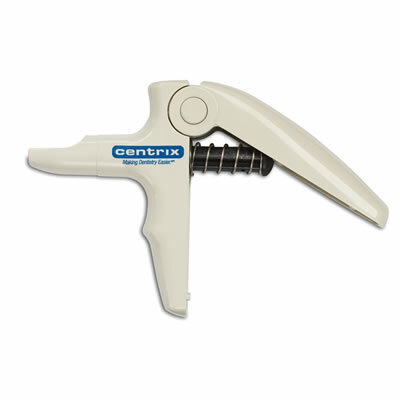 According to Centrix, this new syringe grips any tube and locks into any position. Tubes 'snap' into place without the aid of a plunger, and once material is delivered, empty tubes are 'snapped' out. There is no risk of a tube falling out of the syringe or moving while the patient is in the chair. Compatible with all prefi lled and empty tips currently on the market, the Snub Nose is autoclavable for easy and complete infection control.